An image of the Cigar Galaxy, or M82, composed from data from the Hubble Space Telescope, Chandra X-Ray Observatory, and Spitzer Space Telescope. Recent photographs of an active galaxy offer new confirmationfor the idea that supernova explosions are the creators of surprisinglyenergetic particles called cosmic rays. When a very large star dies, it implodes into a black holewhile expelling its outer layers in a powerful explosion called a supernova. Scientiststhink that some of the energy released during these blasts acts as a sort ofsupercharger, acceleratingparticles to extremely fast speeds and creating cosmic rays. New proof of this idea has come from recent observations ofthe Cigar Galaxy (M82) by the VERITAS gamma ray telescope array in Amado, Ariz.The galaxy sits about 12 million light-years from Earth in the direction of theconstellation Ursa Major (also known as the Big Dipper). It is a starburstgalaxy, meaning it has exceptionally high levels of star formation. 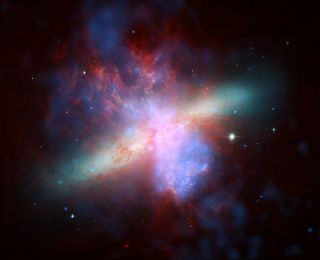 With so many stars forming in M82, there are also highnumbers of massive stars and supernovas, making the galaxy a perfect testingground for the cosmic ray explanation. If supernovas are responsible for cosmicrays, scientists figured, then a place with moreof the stellar explosions will also have higher concentrations of theenergetic particles. Indeed, researchers found that the density of cosmic rays inM82 was 500 times that of the Milky Way, confirming the hypothesis. "This discovery provides fundamental insight into theorigin of cosmic rays," said Rene Ong, a professor of physics at theUniversity of California, Los Angeles, and the spokesperson for the VERITAScollaboration. Though the telescope couldn't image cosmic rays directly inthe distant galaxy, the researchers looked for gamma rays, a very energeticform of light produced when cosmic rays interact with gas and radiation withinthe galaxy. They used this measurement to extrapolate how many cosmic rays liewithin M82. The findings are detailed in the Nov. 1 online issue of thejournal Nature.